Moving to a new home seems like a fun and new experience, but in the minds of children, it often means a completely new start in a new location. This can be a scary transition for the kids, and it often makes parents anxious because they want what is best for their child. To ease the transitional state, especially for holiday moving, there are a few factors which can make it that much easier on the kids. This step is crucial, especially with young kids. Kids ranging from toddlers to young adolescents thrive on familiarity and routines. Most often, a child is consistently attending school followed by any after-school activities they are involved in. Once the kid’s activities are done, they are welcomed back home to a familiar and stable environment. This doubles during the holiday season, as it is a time when a kid wants to be surrounded by loved ones and places. When deciding to move your family, it is important to determine the necessity of the move. For instance, if you are offered a job which is roughly 15-30 minutes away from where you already have a life built up, it may prove beneficial to keep your kids in that stable environment. While a slightly longer commute may be more difficult for you to deal with, your kids will greatly appreciate being able to remain with their friends and familiar life. If you do need to move a greater distance, run the move past your kids. With open communications, it will make the children feel more involved in the process. This is not only limited to discussions, however. If you are moving across town, take the kids to the new house (or the construction site)! This will not only give them a chance to acclimate to the new house but also provides a great time to check out the surrounding area. When driving around the area be sure to visit some local parks, pools, and any other kid-friendly attraction. By showing your kids around it will not only show them their new home, but it will also give them some exciting activities to look forward to. 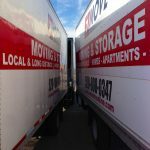 The above tips can be used for any move, no matter the time of year. But the Holidays are a time when kids crave the most stability, as many memories that they form will be from around the holidays. Some say that the best time to move is just after the holidays, but often there is no other option. It is important to maintain those traditions for the kids, even in a new home. With this in mind, consider setting up holiday decorations as soon as possible, and incorporate the children’s involvement. In having your kids decorate the tree or other denominational decorations, it will allow the parents to finish the other preparations. In the new home, having familiar decorations can serve as an emotional anchor which provides an alternative sense of comfort. But most importantly of all, you and your kids should still celebrate the holidays even if you find yourself in a stressful transitioning period. Not only are they something that your child looks forward to all year, but it will also give them something familiar to hold onto in a foreign environment. By spending time with your kid, it will ease the transition. To spend even more time with your child, give EZ Move a call to get help with your holiday moving plans. EZ Move professionals will make the entire process a breeze, so give them a call at (520) 808-0347 today. Holiday Moving: How to Get Your Kids Prepared Overall rating: 5 out of 5 based on 13 reviews.